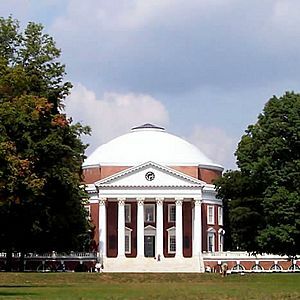 The University of Virginia is a public research university in Charlottesville, Virginia, United States. The buildings designed by Jefferson are a UNESCO World Heritage Site. It was founded by Thomas Jefferson. It was conceived by 1800 and established in 1819. Recent UVA research "redrew the map" of the human lymphatic system, shown here in the 1858 Gray's Anatomy. The S.S. Universe Explorer docked in Vancouver, British Columbia, shortly before embarking on the Fall 1997 Semester at Sea voyage. UVA lacrosse has won 10 national championships, including 8 national titles since NCAA oversight began. English professor Rita Dove has been honored as the United States Poet Laureate and awarded the National Humanities Medal and National Medal of Arts. University of Virginia Facts for Kids. Kiddle Encyclopedia.